Don't Hibernate! Celebrate! During the City's Winterfest Celebration, enjoy live entertainment and many children's activities. 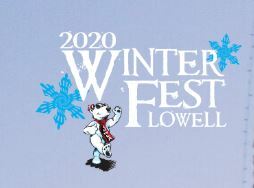 Lowell's annual Winterfest weekend in downtown Lowell is a fun event featuring everything from a carousel and free ice-skating to an all-you-can-eat chocolate festival. Activities include a Craft Beer Showcase, North Bowl Soup Competition, games, activities, the Family Fun Zone and outdoor amusements. There is something for everyone - from local cuisine, to the famous Soup Bowl Competition, the National Human Dogsled Championship, and a breathtaking fireworks display. The Family Fun Zone, located on JFK Plaza, will provide all sorts of fun with music, games, crafts and more! Entertainers will perform with sing-a-longs, magic and dance performances. This year WinterFest will be partnering with the New England Music Awards to bring you some of the best live, local music in New England!